Fangirl has been doing the rounds now for quite some time so I can't believe I haven't picked it up before! Fangirl follows the character Cath who is a bit socially awkward as she leaves her family and is also separated from her twin sister Wren for the first time as she heads off to start college. Cath has to move into a shared room on campus and let's just say her room mate seems a bit reluctant in having to share her room with someone else. This doesn't help ease Cath's anxiety about starting college, not to mention Cath isn't so fond of her roommates supposed boyfriend either who always seems to be hanging around. If the title of the book doesn't give it away, Cath is also someone who writes fan-fiction about the Simon Snow series, which is basically a reference to the Harry Potter series. She has quite the following online. Unfortunately Cath's creative writing teacher doesn't quite get the whole fan-fiction thing and tries to encourage Cath to write about something else which is outside her comfort zone, something Cath struggles to do. I fell in love hard with this book, mainly because Cath is such a relatable character to so many people, including myself. Who hasn't arrived early to a class before, but had to walk up and down the corridor a few times before working up the courage to go in? Or avoided going to a place because they didn't know where it was and was too shy to ask? All the thoughts Cath has whilst being away from home for the first time are so similar to the ones I had and I know many others have had too. There are a couple of grievances I have with this book though. At the end of each chapter there is a page from either the official Simon Snow series or from Cath's fan fiction. Whilst I found these a nice addition for giving an idea of what Cath writes about, I didn't actually find they added that much to the story and if I'm honest I found them slightly boring, although I know some others who have read Fangirl really enjoyed these parts, so each to their own! The pacing of the story I also found to be slightly off. It starts off quite slow which I actually really enjoyed as this is more the telling of someones life, rather than an action packed thriller but I thought that the last quarter of the book felt a bit rushed, like Rainbow was trying to get everything wrapped up nicely at the end. 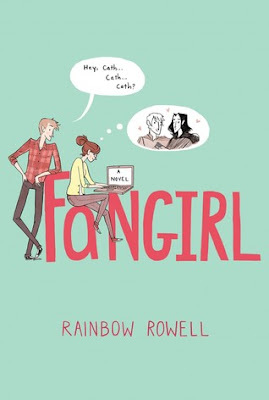 Despite these couple of tiny issues I had with Fangirl, I still loved it and think they are very minor annoyances. This book will make you smile so much whilst reading it and will have you rooting for Cath. I got through this book in two days, I didn't want to put this down and when I did all I could do was think about picking it back up to read again and was sad when it was over. For anyone starting college or university in September and is a bit anxious, give this a read to soothe your mind a bit, and for anyone else, read it anyway because it is a fantastic book. Cath is probably one of the fictional characters I can relate to most, as I'm very shy (and seriously socially awkward! ), and this is one of the only books I've read where that was covered incredibly well. Yes I completely agree about Cath being so relatable! I kind of wish this was book was longer because I was enjoying it so much and wanted to continue.